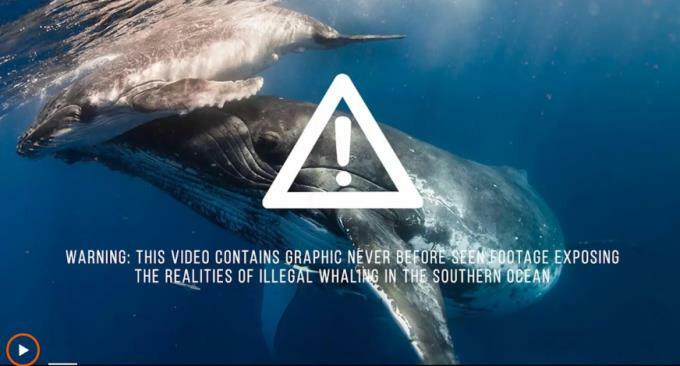 Sea Shepherd, an international non-profit marine conservation movement working to defend, conserve and protect the worlds oceans and marine wildlife, recently released a five years old suppressed footage that it claims the Australian government did not want their own people to see for fear of upsetting relations between Australia and Japan. “This footage shows the bloody brutality, cruelty and senseless killing of such beautiful, intelligent and majestic animals. These whales are hunted down, before being hit with an explosive harpoon that sends shrapnel through their bodies, while prongs come out so that the whale cannot escape. The whale dives to try and get back to the depths below, to its family, but it can’t as the whale killers retract the cable, slowly bringing the whale to the surface, thrashing about in pain before he/she gets to eyeball their killer, before being shot until finally dying, many minutes later in a sea of blood,” said Hansen. Sea Shepherds claims that the Australian Government is lending a blind eye to this otherwise horrible slaughter. Sea Shepherd is asking the Australian Government to do all it can to end whaling, by not only sending a ship to the Antarctic but to also take Japan to the International Tribunal on the Law of the Sea, where Japan can be challenged over its activities as Japan is not meeting its international obligations to sustainably protect whales. The tribunal has a system of mandatory dispute settlement, one that’s very difficult to opt out of and there is very little Japan could do about it,” concluded Hansen.